Anthony COLBY I (1605 – 1661) was Alex’s 11th Great Grandfather two times, through his son Isaac and through his daughter Sarah. He is two of 4,096 in this generation of the Shaw line. I originally thought Dorothy COLBY was the grand daughter of Anthony’s son John, but I now believe she was actually the daughter of John’s younger brother Isaac COLBY and Martha PARRATT. Anthony Colby was born 8 Sep 1605 in Horbling, Lincolnshire, England. His parents were Thomas COLBY and Anna JACKSON. Some claim he was the son of Thomas Colby and Beatrice Fenton and therefore connected to English royalty. This has not been proved. He arrived in America on the Arabella in 1630 with the Winthrop Fleet. He married Mrs. Susanna WATERMAN in 1632 in Boston, Mass. Anthony died 11 Feb 1661 in Salisbury, Essex, Mass. Anthony was admitted to Boston church as member #93, which would be in the winter of 1630/31. In the Boston church records, Anthony Colby is first in the following sequence of names: Anthony Chaulby, John Boswell, Joseph Redding, Garrett Hadden. In the Massachusetts Bay lists of freemen, Anthony Colby is third in this sequence: Jerad Hadden, Joseph Redding, Anthony Colby, John Bosworth. 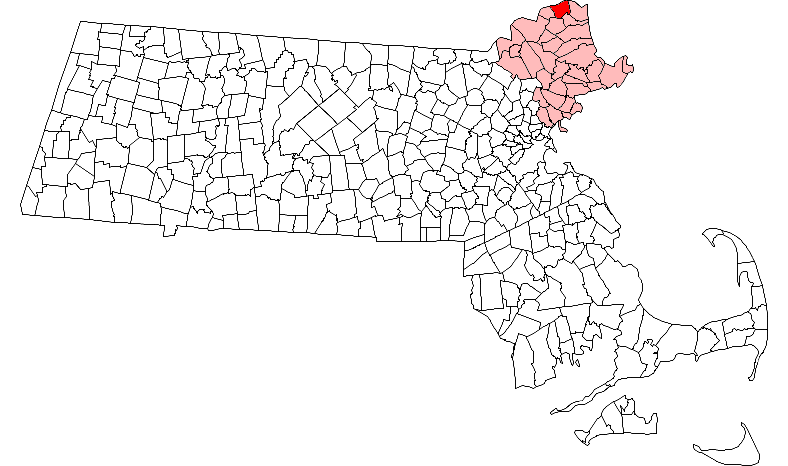 Colby, Bosworth, Haddon and Redding all moved from Boston to Cambridge by 1633 . Colby moved next to Ipswich (1637) and then Salisbury (1640); Haddon moved next to Salisbury; Redding moved next to Ipswich (1639). All three were single men in 1630: Colby married about 1633, Haddon married about 1639, Redding married about 1640. The grouping of these four men in 1630 and 1634, and the concerted migrations of the three survivors, suggest that the four were associated in some way. The gap between church admission in 1630 and freemanship in 1634 suggests that they may not yet have been twenty-one in 1630, and this is supported by the approximate dates of marriage. Taken together, these facts and suggestions indicate that John Boswell/Bosworth, Anthony COLBY, Garrett Haddon and Joseph Redding came to New England as servants, and were perhaps all from the same part of England. A survey of the members of the Winthrop Fleet produces one man who settled first in Boston, then moved to Cambridge and on to Ipswich, and who was wealthy enough to have brought four servants with him – Gov. Simon Bradstreet. As a working hypothesis, then, “”The Great Migration Begins” proposes that this grouping of four young men were from the vicinity of Simon Bradstreet’s home at Horbling, Lincolnshire, and came to New England in 1630 in his service. Susanna [__?__] was born in 1608 in England. Her father was NOT Jarret (Jared) Haddon. She first married [__?__] Waterman. 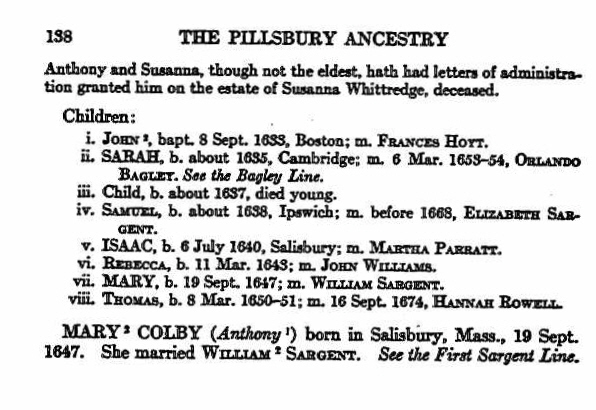 After Anthony died, she married William Whitridge in 1663 in Salisbury, Mass. Susanna died 8 Jul 1689 in Salisbury, Mass. William Whitridge was born in 1599 in Benenden, Kent, England. William died 5 Dec 1668 in Ipswich, Essex, Mass. 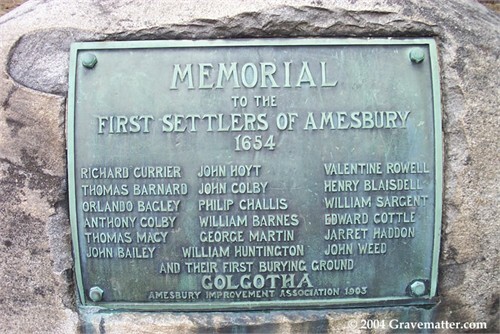 Amesbury was settled in 1655 as a part of Salisbury, but was separated from Salisbury in 1666 and incorporated as the town of Amesbury in 1668. Beginning as a modest farming community, it developed an aggressive maritime and industrial economy. The 90-foot (27 m) drop in the falls of the Powwow River provided water power for sawmills and gristmills. Shipbuilding, shipping and fishing were also important. The ferry across the Merrimack River to Newburyport was a lively business until the construction of bridges to Deer Island. 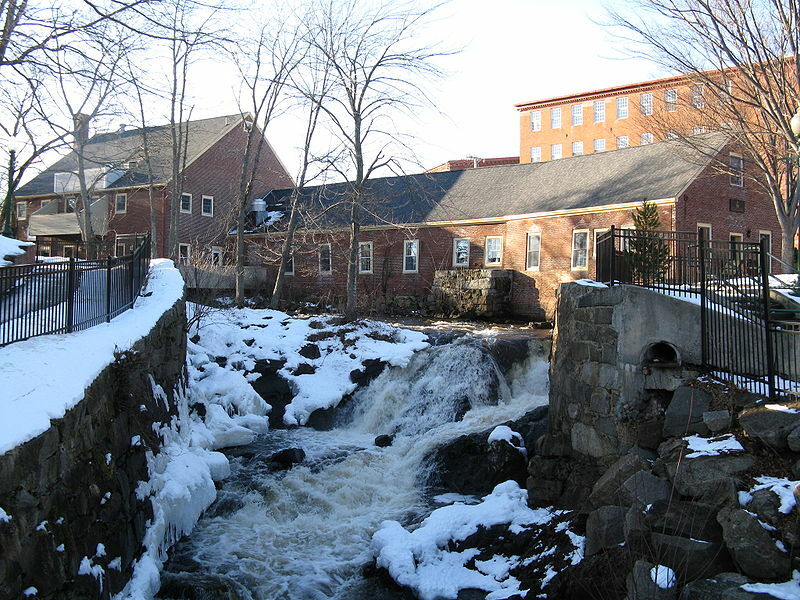 Newton, New Hampshire would be set off from Amesbury in 1741, when the border between the two colonies was adjusted. 2. Sarah COLBY 1635 Cambridge, Middlesex, Mass Orlando BAGLEY Sr.
6 Mar 1654 Salisbury, Mass 18 May 1663 Boston, Suffolk, Mass. Anthony was one of the largest property owners in Amesbury, Mass. 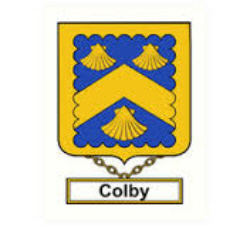 Colby is a place name deriving from the parish of Coleby, which lies 17 miles northeast of Semperingham, and 6 miles south of Lincoln. There is also a parish of Coleby in Norfolk, next to Beccles, and it too seems to have been the source of a quite unrelated Colby clan. The name is of Viking origin and means “coal place.” Cole is the Viking word for “coal” and the “by” suffix is the word meaning “homestead of farm.” Thus, Colely was probably a farmstead where charcoal was made in ancient times by Viking settlers. 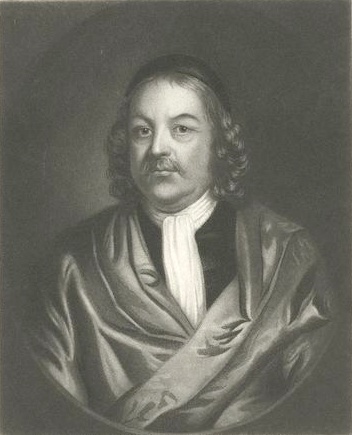 Anthony Colby came to America in the spring of 1630 on the ship “Arabella” with the “Winthrop Fleet.” His first home was in the disputed territory between Cambridge and Watertown which was given to Cambridge in 1632, and was on the road to Mount Auburn close by the river. In 1633, on the second Sabbath that Rev. John Cotton preached, and he baptized his own son, Seaborn Cotton, and John Colby, the son of Anthony Colby. Susannah had to defend her homestead against the claim of Thomas Macy from whom it had been purchased. 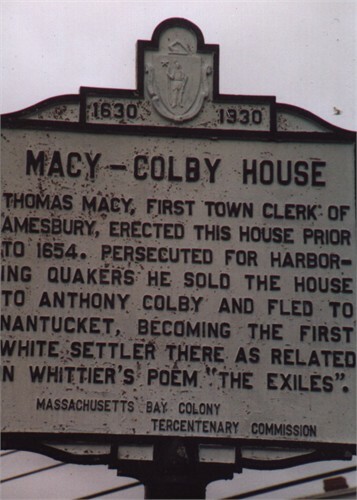 At about the time of the sale, Macy had fled to Nantucket to escape the penalty of sheltering two Quakers during a thunderstorm, but later he denied the sale and tried to expel the widow and her family by legal process. Anthony built a second house near the Washington Elm and a third one near the Fresh Pond. He was admitted as a freeman in Cambridge in 1634. Three years later he appeared in Ipswich, and three years after that in Salisbury, MA. Anthony Colby was among the first settlers of the latter town. Together with Jared Haddon, they joined the Church in Charlestown and took the freeman’s oath in Cambridge on 14 May 1634. Together lay their houselots in east Salisbury and when Jared sold his homestead in 1644 and built in what is now Amesbury, Essex County, MA. Anthony bought the lot adjoining and came with his family. On this land Anthony at last settled down to make a permanent home. In 1640 Anthony Colby was appointed an appraiser for the government. Then in 1651 he was elected a selectman. 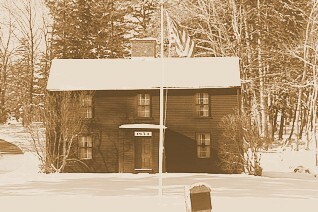 The old house of Anthony Colby was on the southwest side of Main Street, which leads from Amesbury Center to the Merrimac, and was the seventh from Bartlett’s Corner. Here stands the well that was described in Whittier’s poem, “The Captain’s Well.” The well was dug by a grandson of Anthony’s daughter, Mary. In August 1659 in Salisbury, Mass, Thomas Macy was caught in a violent storm of rain, and hurried home drenched to the skin. He found in his house four wayfarers, who had also come in for shelter. His wife being sick in bed, no one had seen or spoken to them. They asked him how far it was to Casco Bay [Maine]. From their dress and demeanor he thought they might be Quakers, and, as it was unlawful to harbor persons of that sect, he asked them to go on their way, since he feared to give offense in entertaining them. As soon as the worst of the storm was over, they left, and he never saw them again. They were in his house about three quarters of an hour, during which he said very little to them, having himself come home wet, and found his wife sick. He was summoned to Boston, forty miles distant, to answer for this offense. Being unable to walk, and not rich enough to buy a horse, he wrote to the General Court, relating the circumstances, and explaining his non-appearance. He was fined thirty shillings, and ordered to be admonished by the governor. He paid his fine, received his reprimand, and removed to the island of Nantucket, of which he was the first settler, and for some time the only white inhabitant. Our ancestors Thomas COLEMAN and Edward STARBUCK were also original settlers of Nantucket. 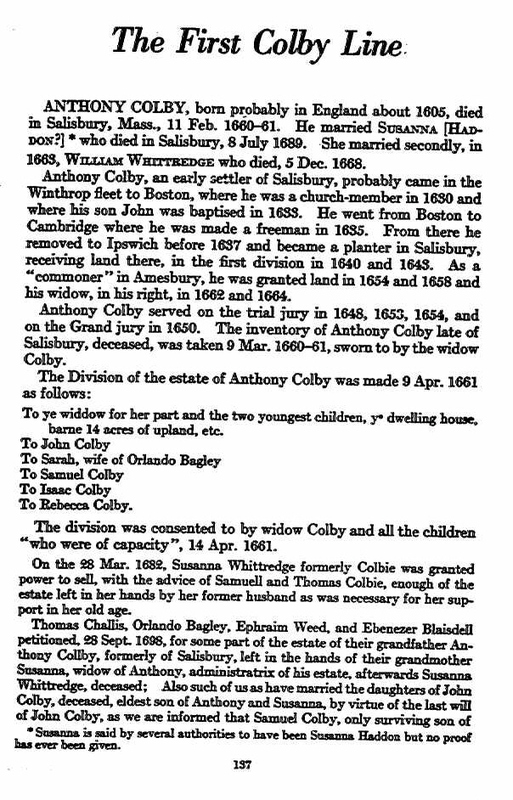 Anthony Colby died on 11 February 1660 in Amesbury, MA. In his biography, Anthony left London, the Isle of Wright, in March of 1630 with more than 400 others and arrived on the ship Arbella at Boston. He lived on shipboard for 4 months before housing could be made. Anthony first lived in Boston, then Ipswich, Salisbury and Amesbury. He was called a planter and received land in the first division in 1640 and 1643; he was one of the first commoners of Amesbury where he received land in 1654 and 1658, and his widow in his right in 1662 and 1664. Anthony became a church member in Boston and he was living in Cambridge in 1632, he was affirmed a freeman and took the oath on 14 May 1634. He was at Ipswick in 1637 and he married Susannah ??? about 1632 in Boston, MA. The inventory of the estate of “the widow Susannah Whitridge who deceased July the 8th or thereabouts in the year of Grace 1689” was taken 9 September 1691 and totalled £151 15s. including real estate valued at 143: “5 acres of tillage”; “half the ferry meadow”; “a lot in the division called the great farms”; “a lot of upland in a division called [illegible]”; “a lot in the ox pasture division”; “a lot near the north meadow”; “a lot in Bugsmore division”; and “a lot in the great swamp” [EPR 304:400]. The final division of the estate of Susannah Whitridge on 5 August 1700 allowed a double portion to “Samll Coleby Eldest [surviving] Son” 1. 12s. 6d., and equal shares of 16s. 3d. to: “the children of John Colby…”; “the children of Isaac Colby…”; “the children of Thomas Colby…”; “the children of Sarah Colby…”; “the children of Rebeckah Colby…”; and “the children of Mary Colby…” [EPR 307:176-77]. MARRIAGE: By 1633 Susanna (_____) Waterman, widow of _____ WATERMAN of Boston (land “at first was granted to [blank] Waterman who deceased. Anthony Colbye married his widow & they two sold the said land unto James Pennyman…” [SLR 11:176-77]); she married (3) by 1663 William Whitridge (petitions as Susanna “Whittredge formerly Colbie” to sell real estate 28 March 1682 [EPR 1:409]); she died 8 July 1689. In case you’re wondering, I don’t know if Gardner Colbym, the namesake of Colby College, is a descendant, but it sounds likely. Chartered in 1813 when Maine was still part of Massachusetts, and originally called the Maine Literary and Theological Institution, Colby is one of the oldest colleges in New England. After Maine separated from Massachusetts, the new legislature conferred upon the school the right to grant degrees, and in 1821 the institution was renamed Waterville College. The turmoil of the Civil War severely tested the resources of the College as many students left the all-male campus and the school appeared to be on the verge of closing. At that point Gardner Colby, a well-to-do Boston merchant and local Maine native, stepped in to provide the funding necessary to avert tragedy. The grateful Board of Trustees thanked him for the gift by promptly renaming the school after him. Samuel’s wife Elizabeth Sargent was born 22 Nov 1648 in Salisbury, Mass. Her parents were William SARGENT and Elizabeth PERKINS. Elizabeth died 5 Feb 1736 in Amesbury, Mass. Rebecca’s husband John Williams was born 25 Oct 1636 in Salisbury, Essex, Mass. His parents were John WILLIAMS and Jane GOULD. After Rebecca died, he married Hester Blakeley (widow of John Bond) in 5 May, 1675 Haverhill John died 30 Apr 1698 in Haverhill, Mass. Mary’s husband William Sargent was born 2 Jan 1645 in Salisbury, Mass. His parents were William SARGENT and Elizabeth PERKINS. William died 31 May 1712 in Amesbury, Mass. 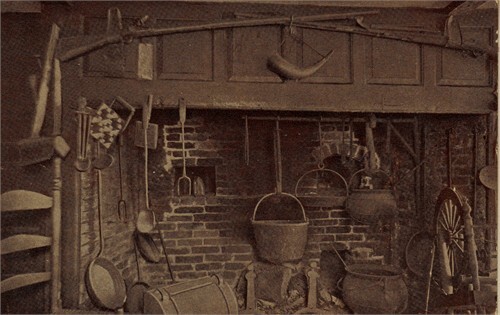 Thomas’ wife Hannah Rowell was born Jan 1653 in Salisbury, Essex, Mass. Her parents were Valentine Rowell and Ann Currier. Hannah died 9 Aug 1707 in Amesbury, Essex, Mass. This entry was posted in 13th Generation, Artistic Representation, Dissenter, Double Ancestors, Historical Monument, Historical Site, Immigrant - England, Line - Shaw, Pioneer, Public Office, Storied and tagged Salisbury Pioneer, The Arabella 1630. Bookmark the permalink. The 1630 ship manifest for the Arabella clearly shows Anthony Colby’s wife as Mrs. Susanna Haddon Colby. The connection is quite obvious that (1) Anthony and Susanna were already married before they left England and (2) that Garrett Haddon and Susanna Haddon were related. Best guess is that they were brother and sister.